Time to leave Massachusetts and return to Connecticut. The Patriot’s Day Holiday had forced a change of plans. I had really wanted to visit the Granville Town Hall and I was determined that today I would stop there. This meant that I might have to give up some other side trip or outing. My ultimate goal was Bristol and their public library history room which was open 2-4 pm. 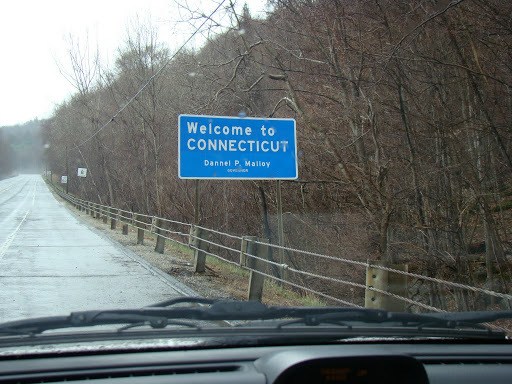 I checked out of the Comfort Inn and headed back to Connecticut. This Comfort Inn is not as good as others that I have stayed at. I actually have upgraded from Days Inn’s to Comfort Inn’s and received much better accommodations. My room was okay except for the huge bathroom and no shelving for the handicapped. Loved the shower with all the handle bars and movable shower head. Showers can be a challenge when you travel. The laundromat was on the first floor in a stacked arrangement and I put all my quarters into the dryer first….AUGH!! The receptionist told me to go to the corner for more change. Hmmm….what has happened to the concept of Petty Cash? I am sorry, I should not rant! There are so many more motels around this area of Hwy 20/7 that they might be worth checking out and as far as I could see they all looked in good condition? Comfort Inn does serve breakfast and they have a points reward program. I have liked my past rooms and the service. 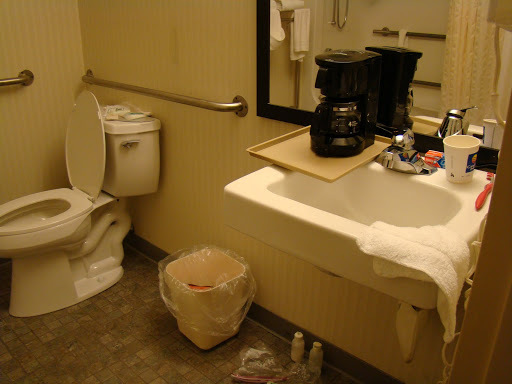 Coffee Maker carefully situated on the sink! 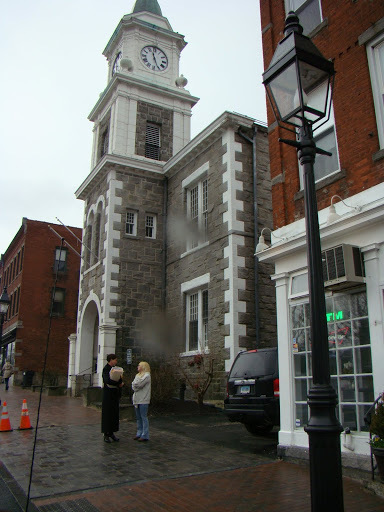 My goal is to head for Litchfield, CT but before that I want to stop in Granville and visit the town hall. 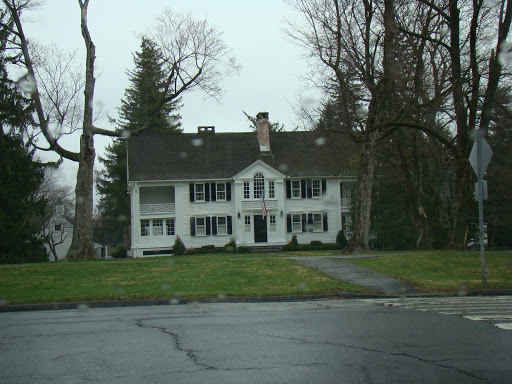 I originally planned to stop in Barkhamsted and try to find the tavern of Thomas Goss brother to Philip Goss IV who migrated to Simsbury, Granby and Granville. I think his tavern is where the Christmas Tree farm is north of Barkhamsted Center. The original burned a while back. Still seeing where he lived would be interesting. I didn’t have the time if I was to be in Bristol at the library before the History Room closed at 4 pm. There is a Barkhamsted Historical Society and it might be a good idea to do a little more investigating before attempting this. I will talk a little more at Thomas Goss later in this post. I knew the road to Granville. So it was easy to drive down Hwy 20 to Hwy 8 to Hwy 57 and make my way along. I passed the covered bridge again just north of New Boston and turned sharply left onto Hwy 57 and headed east to Granville. This second time went fast and I zoomed by Rose’s home. Someone was raking in the yard. I kept going although it was tempting to stop and say hello? 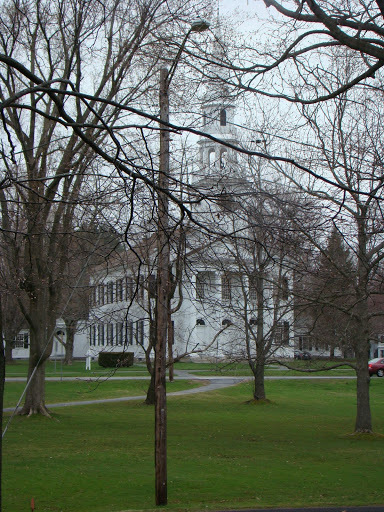 The Granville Town Hall is a bright white. I was a little concerned that the Administrative Assistant might not be there but I spotted a car and knew it was open. I had been told by the town clerk when I called that if she was not there I could leave a note if I wanted something. I had confidence that I would be able to access the records for Granville. Rose told me the Administrative Assistant should be there but I should call. I did email but it was like a holiday and the chance she would see it would be small. You park on the right side or in the back. You enter the building through the door in the back. The front doors are locked. The Administrative Assistant was there and helping a man with his taxes. I explained I wanted to look at the vital records and she said the town clerk was not in but I could look. 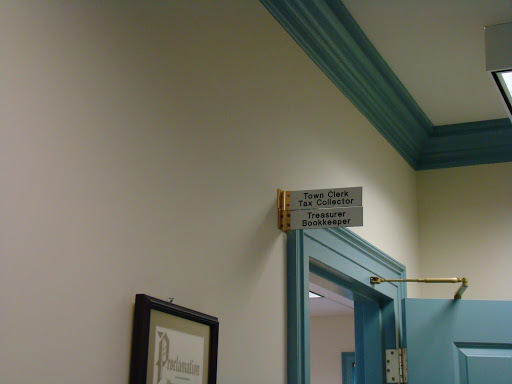 She led me into the town clerk’s office and took me behind the wood swing gate to the metal filing cabinets and on top were metal card files. She cleared off a desk area for me to work. She explained that the information was in the card file. She left returning to her office on the other side. No one was in the room. These are cards with hand written names, dates and information on them and not much else in information. 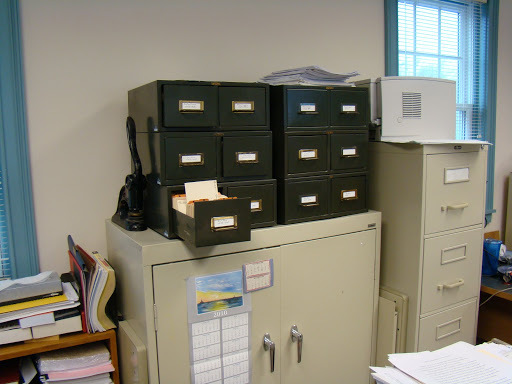 The vital records of Granville, MA in the dark metal card file drawers. I studied the dates and pulled out the drawer I wanted and started taking photographs of the cards that I was interested in with the names Goss, Haskell, Rose, Gibbons etc. I looked at birth, marriage and death. Before I left I wrote out a note asking for the birth record for Solomon Goss and gave my $5.00. I asked were the original records were and was told they were too fragile and that was about it. I am very confused? This is the second town hall in Massachusetts and so far no original records. Now that is not very many town halls. Hmmmm….!! I did appreciate being given access to these records on the cards. No more time for dallying. So I headed west on Hwy 57 back to New Boston and turned the car south Hwy 8 and headed back to Connecticut. Boy did it come fast. A lake came into view on my left and I realized that Connecticut was very close. Not always easy to get a sign like this with no parking in site! Now I was planning to turn and go to Riverton and then north and around to Barkhamsted Center but decided that I need to press on. I was soon in Winsted and it was now or never to go east to Barkhamsted? I opted to continued south on Hwy 8 which had become a very nice four lane highway and was a dream to drive on. 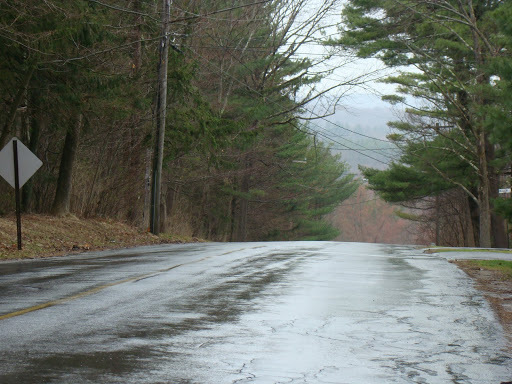 Barkhamsted is where Thomas Goss lived and he murdered his wife Eunice because he thought she was a witch or as the story goes? Thomas Goss was a brother to Philip Goss IV who married Mary Kendall. Thomas had been in Granville and then he migrated to Barkhamsted. He is listed with Philip Goss on the Granville Land Map that I viewed at the Granville Public Library. 2. Article #5 – No Title Connecticut Courant and Weekly Intelligencer (1778-1791); Aug. 29, 1785, ProQuest Historical Newspapers pg. 3. “Litchfield, Nov. 15, Laft Wednefday Thomas Gofs, late of Berhamfted was executed at this place, pursuant to the fentence of the Superior Court for the murder of his wife, — His defence, upon trial was Infanity…” “and under pretense that his wife was a witch…” I obtained this on the internet at a Connecticut Library which has access to the newspapers. You might be able to get copies in some other way? Thomas Goss served in the Revolutionary War and that might have caused some problems afterwards. Here is one source about this service. Soon I was at the turn off for Hwy 118 to Litchfield which is not that far to go. Litchfield is wonderful. I immediately liked what I saw. They have a great big town green that is divided up with streets and you do have to pay attention to the streets signs and highway signs. I turned on South St. (Hwy 63) and then parked my car across from a long line of buildings that must be their downtown area. 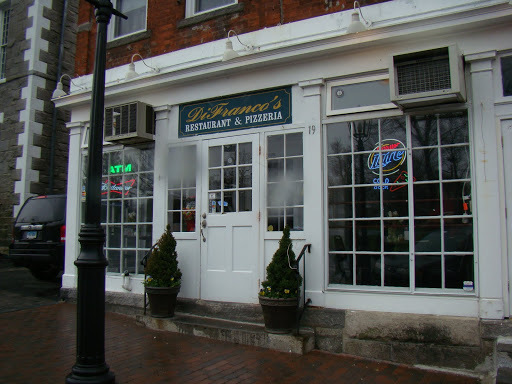 There was a restaurant named DiFranco’s and I decided to give it a try. Perfect, just what I wanted a sit down restaurant with a variety of items to choose from. I sat in the window so I could watch the action outside. People looking very much like lawyers were coming in and out of this building that looked more like a church and I asked a man if it was the courthouse and he said “yes.” You can see rain drops on my camera lens! 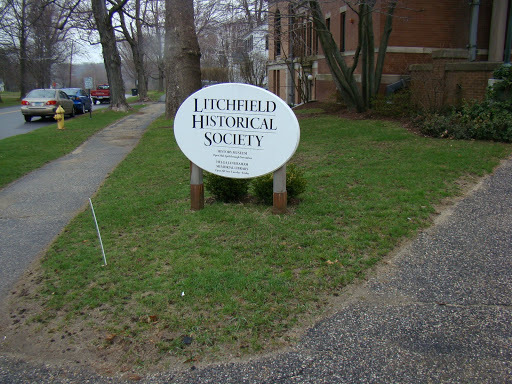 Down the street to the east on the corner was the Litchfield Historical Society. It was after 11 am and I knew that I might after all be in luck and be able to visit it. Sure enough it was open. I was greet by a nice friendly receptionist who asked me to sign in and I think I paid $5.00? I told him what I needed was to find out information about Thomas Goss and he sent me downstairs to the Archives. Right on the corner ! One of the attendants behind the desk offered to help and I told her about Thomas Goss and she jumped up and went into the back through a door and a few minutes later she and another person came out with a file folder with a few items in it about Thomas Goss. They had the two articles I had obtained from the Connecticut newspaper and have listed above and another article from the Litchfield paper which she gave me a copy. 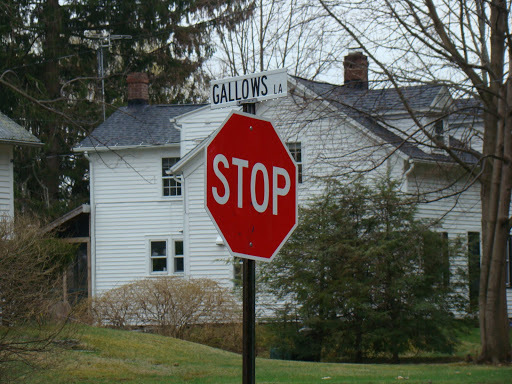 I asked her were he might have been hung and she mention Gallows Lane featured in the article. Then she said quietly that they really didn’t know. I said “Gallows Lane and where is that?” So she pulled out a another map not the Walking tour map of Litchfield that I had found and showed me it was south on Hwy 63. Gallows Lane is flat when you first approach and then there is a steep hill to a valley below. It is very short with trees on one side and houses on the other. The tree is long gone but it is believed to be haunted. I guess I have watched too many CSI’s. Now there is another family of interest in Litchfield. Oliver Wolcott Sr. buried in the East Cemetery in Litchfield and Oliver Wolcott Jr. Their houses are in Litchfield on Hwy 63. 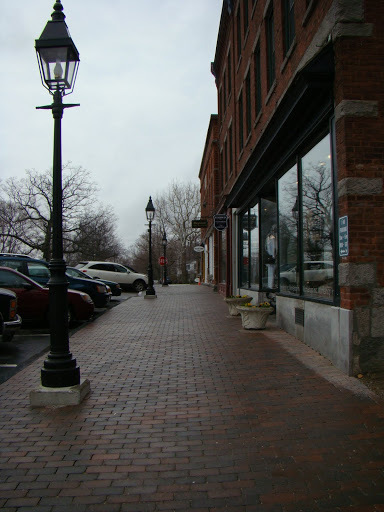 The Walking Tour of Historic Litchfield. According to this map the Litchfield Library is Oliver Wolcott Jr’s home and across the street is opposite Wolcott St. as it butts up to South Street is Oliver Sr’s home. Litchfield would be worth returning to and exploring it was lovely even in the rain! It took awhile for the bags to be delivered and I pondered the airport. I had no memory of Bradley. It is not a fancy airport with nothing interesting to note like some have soaring windows and art work. They had been doing a lot of remodeling so there were big open high windows that let in the light and signs of construction. The man at the car rental information desk told me to go through the door to the right and just wait till the shuttle came. I didn’t have to call. It took about 5 minutes and I was on my way to the car rental lot. Thrifty’s lot is east of the airport on Spring St. The driver was a little maniac and threw my computer case and I yelped not too! Check in was swift although I had trouble hearing the young lady behind the counter and forced her to repeat things. She was talking way too fast for my flight stressed ears. I teased her about the snow but she assured me that I would not have any problem driving even in Massachusetts????? My rental was a Chevy Aveo in bright white. The plates were Massachusetts plates. Maybe they will not tailgate me too much in Connecticut??? Last time the car had New York state plates. I was soon packed up and ready to go. My first goal was to return to Windsor, Connecticut and to revisit the Palisado Cemetery. It is Sunday so nothing is open like the town offices and the historic society, but I am okay with that. 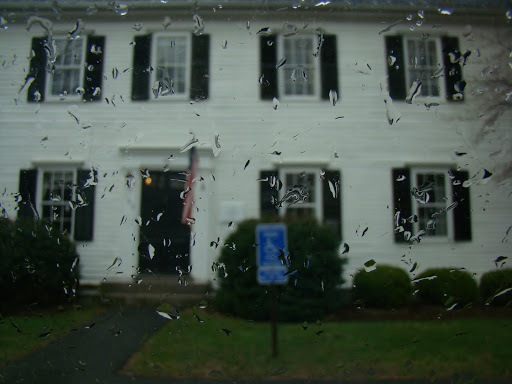 I had visited the Windsor Historical Society the last time in Connecticut. It is wonderful. The staff are friendly and helpful. They have a wall of filing cabinets filled with family history and I selected several manuscripts on the Wolcotts. I also worked on solving some source problems in the Paul H. Goss manuscripts. (See below for more information on this society). Paul H. Goss had done a great deal of research on our Goss family in the 1930’s and 1940’s and I have been collecting his articles and manuscripts for over 10 years. I have been revisiting the sources. I had forgotten that Windsor was almost in two parts. 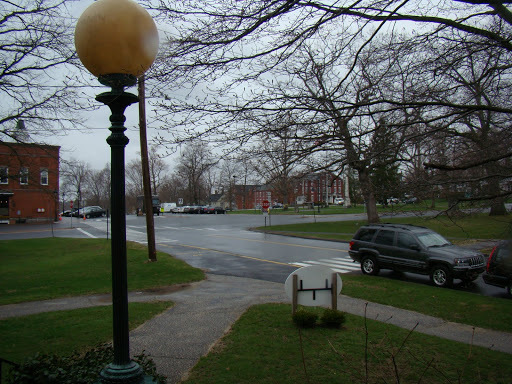 The actual town center with the village green and the area north of the train tracks where the cemetery and historical society are located. 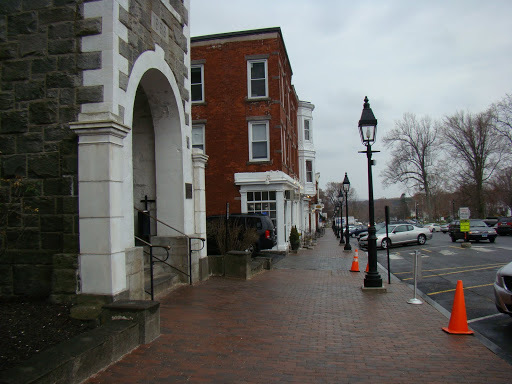 A stopped at the Geissler Market (IGA) for supplies and then a little exploring of the town village green where I found the library, town hall, chamber of commerce and visitor center. The town sign is in two parts so you have to photograph both sides. Book: Cemetery Inscriptions in Windsor, Connecticut, Copied under the Direction of the Abigail Wolcott Ellsworth Chapter, National Society Daughters of the American Revolution, 1929, Second Edition 2000. This booklet covers the Palisado, Riverside, Old Burying Ground, Elm Grove and St. Joseph’s Cemeteries and more. It does have an index. 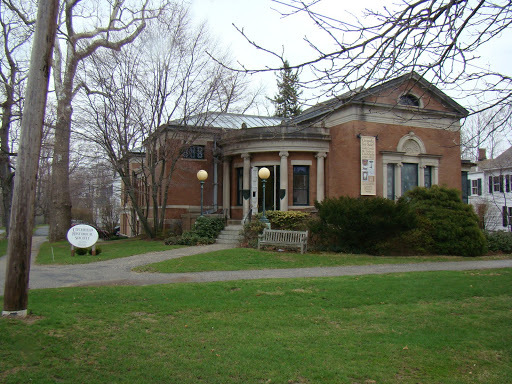 My copy was purchased at the Windsor Historical Society but I think you can get it at the Connecticut State Library and Connecticut Society of Genealogists. The Palisado Cemetery is peaceful and well cared for. 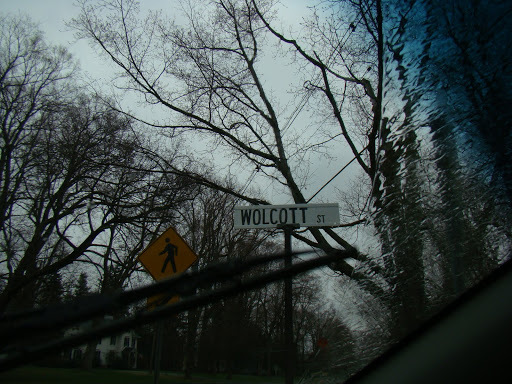 The Wolcotts are buried there along with many other settlers. Simon and his father Henry are there and so is Roger (a governor of Connecticut). I am not sure about Martha? She is listed on Simon’s tombstone but might be buried in East Windsor? She did remarry after Simon died in 1687 to a Lt. Daniel Clarke and he is not buried in this cemetery according to the above book. She would have been about 50 years old in 1689 so I don’t think they had children. She died in 1719 so she lived a long time after Simon’s death. The Wolcott tombstones are hard to read and difficult to photograph because they are these flat stone with legs much like a table. I did not have any better luck this time because I was loosing the light. Something about sunset at 7:14 pm…hmmmm….? Here lies waiting for ye/Resurrection of Ye Just/Mr. Simon Wolcott/born 1625 Dyed Sept 11, 1687/Also Martha Pitkin/wife of Simon Wolcott/born 1639/Dyed Oct’r 13, 1719, pg. 77 of the book mentioned above. Why am I interested in the Wolcotts, well, a grandson of Simon and Martha by the name of Benjamin Cooley married Margaret Bliss on 31 Jan 1701 in Longmeadow and they had a daughter named Keziah Cooley. Keziah married Philip Goss on 25 Nov. 1723 in Brookfield, Massachusetts. I call this Philip number III a grandson of the Philip Goss (Philip I) of Roxbury (Brookline) or Muddy River which are now part of Boston. Philip Goss (I) later moved to Lancaster about 1687. Benjamin’s father was Lt. Daniel Cooley (1651 to 1727) and his mother was Elizabeth Wolcott (Roger was her younger brother – 1662 to 1708, and a governor of Connecticut). Elizabeth was the oldest daughter of Simon and Martha Pitkin Wolcott. See the photos at the end of this post. I wanted to find Oliver Ellsworth’s tombstone this time. Oliver married into the Wolcotts. He married Abigail Wolcott. Abigail is a great granddaughter of Simon and Martha Wolcott and a 2nd cousin 8 times removed to me. HA! Oliver was Chief Justice and quite involved with the politics of the day. A happy visit to his home now a museum on the north side of Windsor, CT occurred when a big truck tailgated me back in 2007. So in order to get rid of him I turned into the Oliver Ellsworth museum area and much to my delight the DAR chapters were giving him a birthday party! (Note the balloons in the photo below!) They had cake and tours given by the DAR ladies dressed in costume. They actually have a small library with books and brochures and I believe I found a genealogical lineage chart of the Wolcotts there? It took a little carefully investigating but I found Oliver Ellsworth’s tombstone which was south east of the Wolcotts. It was much further back in the cemetery than I had realized. ﻿ There is also a map of the Plan of Ancient Windsor 1640-1654 that you can obtain from the Windsor Historical Society. Mine is dated November 2000. It has the locations of the various settlers, roads, land names and locations. Here is the website for this society: http://windsorhistoricalsociety.org/ You can sign up on their email newsletter. I highly recommend a visit and time to do some research. The Windsor Historical Society website has a wonderful manuscript about Martha Pitkin Wolcott which is worth reading. Martha is a very interesting lady and their are wonderful stories about how the town tried to keep her from returning to England. Book: The History and Genealogies of Ancient Windsor, Connecticut 1635-1891, Vol. II, by Henry R. Stiles, Picton Press, 1992. Wolcott genealogy starts on page 798. Purchased at the Windsor Historical Society for a good $40+. I am sure you can find this in any large library. Note: Some photographs are from the 2007 visit. The header picture is of the Palisado Cemetery in Windsor 2007. The following photographs are from this trip. As you can see I was loosing the light as night was coming but you at least get to see how the stone looks like. Here the sunlight gave one last glow on Henry and Elizabeth’s stone crypt. The inscriptions are on the sides Henry on the left and Elizabeth on the right. Simon’s table stone is to the left and Roger’s is to the right. I have more photographs of this cemetery but I am going to have to do a little photo work to make them better to view. That will probably wait till I return home in several weeks. So there will be updates and additions to this blog to come. Lodging: I stayed at the Comfort Inn in East Windsor which is on Prospect Road (Hwy 5.) Dinner was at Sophia’s Restaurant right across the street. I remember this restaurant from the last trip. This time it was a better dinner. It is sort of like a Denny’s but maybe a tad better. It was getting late and they were starting to show signs of the end of the day as the waitresses gathered for dinner at one of the tables and the lights were out in one of the sections of the restaurant. UPDATE: 10/10/2012 – I discovered that the pictures I had placed in this post were compromised somehow. 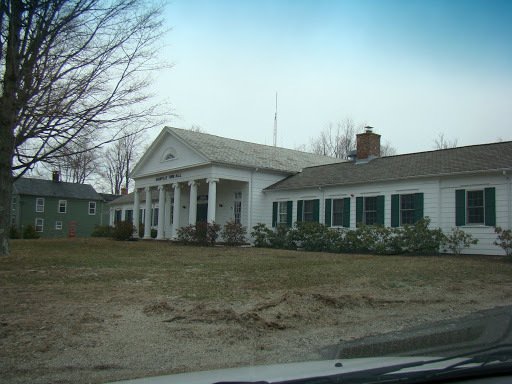 I suggest you go to Google Images and put Palisado Cemetery, Windsor, CT in and it will take you to the photos for that cemetery that I took in 2011 and more.